Across the hills and over the 'hurst we seek out all the pork rolls available around the CBD eastern fringe. Darlinghurst and Surry Hills were bound to have a few fashionable variations on the traditional pork roll. They also up the ante on price too, with most averaging about $6.00 and many over. We had to try a few versions of banh mi that you wouldn't find in your usual hot bread shop, we wanted to have a good rounded idea of the fashionable versions versus the traditional and beloved b-kyu ones. Starting out from the corner of Hay and Elizabeth Street is a row of places, some long timers and other newer places offering some competition. With the original store in Enmore and spreading its wings to Surry Hills, this is a notch above the standard hot bread store roll with an accompanying notch above in price. Roast pork roll, $9. Great Aunty Three don't offer a classic pork roll, so the roast pork had to suffice. This was not such a bad thing, the roast pork and crackling made it a hearty roll. The crackling gives the pork a textural crunch factor, careful of your expensive crowns as you crack through the hard piggy skin. Great Aunty Three is at 92 - 95 Wentworth Ave, Surry Hills. Long time roll vendor with a flashing 'Now Baking' sign. $6 pork roll. We've tried this roll a couple of times. The first time the roll seemed to be all meat and lettuce. They offer a nice touch of warming up the roll for you, but it still was a little soft. They do have an oven in the back of this tiny hole in the wall store. V8 Roll is at 5/242 Elizabeth Street, Surry Hills. Inside the circular food court in Centennial Plaza on the corner of Foveaux and Elizabeth Street, this small store offers rolls, rice paper wraps and noodle soups. $6.00 for a 'Classic Vietnamese pork roll' here. The meat was generous and there was not too much carrot and other fillings. The roll creator also enquired if I'd like lettuce, and when I replied 'no' her response was that lettuce wasn't used in a traditional roll anyway. Just how we like it. Taste of Saigon is at Shop 9, 300 Elizabeth Street Sydney. Phone 02 8068 6051. There are some tables in the inner arcade where you can sit and eat your roll. The original of the Taste Baguette chain of sandwich stores that are spread across the CBD. $6.90 for the Traditional Pork Roll. The fillings available for this roll seem to change on the day. The day we went the pork was a terrine style, not the usual roast pork and cha lua. The prices also seem to change depending on which Taste store you go to. Taste is at 38 Foveaux Street. Phone 02 9281 7228. Part of the group of busy food stores at the Central Station end of Devonshire Street. A $5.50 pork roll that could have been greater. The roll was not so crunchy but nice thick slices of cha lua, large orange pickled shred and not too much salad. D'lish Wrap n Roll Vietnamese Eatery is at 2/90-9 Devonshire Street, Surry Hills. Cakes, rice paper rolls and pork or chicken salad rolls in a small sandwich bar. $6 pork roll. A pang of disappointment shoots through when I can see the roll getting spread with pate and mayo. The roll is soft under the knife, no crunchy roll happening here. It's almost hot dog bun soft. The one consolation is the roll is easier to eat but that missing crunch haunts me. Crumbs is at 84 Devonshire Street, Surry Hills. A small range of dishes and a selection of banh mi in a bright space along Elizabeth Street. $7 for a pork roll. Crunchy bun and great fillings, slow beginners service. It took quite some time to get through the ordering line and then wait for the bun to be made. Mum's Table is at 457-459 Elizabeth St, Surry Hills. We'll keep this one in for posterity. For $9, this roll was in the pricier end of the roll spectrum. The roll was a little burnt on the bottom and quite soft like a hot dog roll and there was only a small amount of roast pork. No pate, some pickles and some herbs. To be honest, this was a little disappointing for the price and the reputation of the place, you also might come away wanting to eat a little more afterwards. 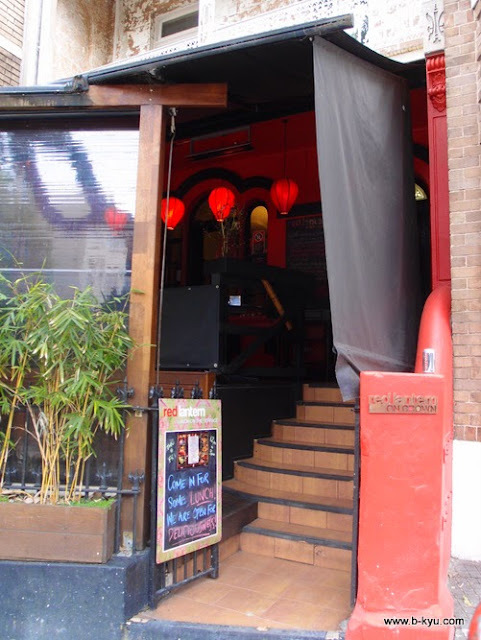 Red Lantern on Crown was at 545 Crown Street Surry Hills. It's closed now, replaced by Pork'd. Known mostly for the rice paper rolls, it's banh mi here we are seeking. What we found was under par for the $9 price tag. A single slice of roast pork and some bits of iceberg lettuce do not a pork roll make, let alone a pricey one. Miss Chu is at 150 Bourke Street, Darlinghurst. Specialist banh mi store almost on the Darlinghurst / Kings Cross border. $7 for a standard pork roll, called Ol' Fashioned here. For a specialist roll store, there really isn't much excuse for a soft bun and the kinda sloppy presentation. The meat was standard and fillings close to overflowing (especially the orange shred). We tried them twice and the second time was a bit better. Bun Mese is at Shop 2, 304 Victoria Street, Darlinghurst. 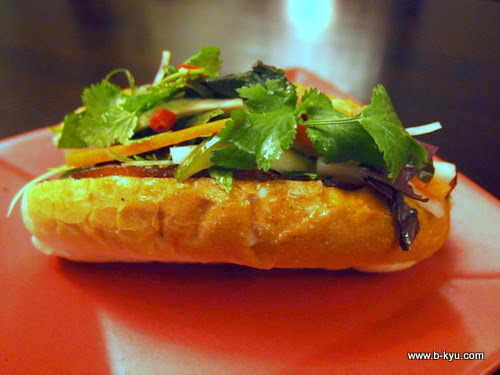 Unassuming Vietnamese restaurant pulls out a banh mi option at lunchtime. For $6 this was a good roll but not great. The bun was a little soft and the meat fillings a little light on. Dragon Den is at 259 Victoria Street, Darlinghurst. Heading into the last lap we trek down Oxford Street in Darlinghurst for Mr Crackles. If adding shredded carrot and cabbage to a roast pork filled baguette makes it a 'Vietnamese' style then Mr Crackles are in that game. At $13 this is one expensive roll compared to the other classics in the area. There were a few pieces of crackling floating on top but there are better value for money rolls in the area. Mr Crackles is at 155 Oxford Street, Darlinghurst. Watch out for the vicious attack pigeons on the shop sign. Vietnamese Rolls or Rolls on Oxford has a bit of a fan base in the area, there was some expectation here. The roll is actually half a baguette, there is an option to buy a larger roll. At $6.90, it's a little pricier than most and not really a lot different from the $4 to $4.50 variety. Lots and lots of orange shred, standard pork fillings and a good pate. Rolls on Oxford is at Shop 23/63 Oxford Street Darlinghurst, just inside a little shopping centre arcade. Any others we have missed? Let us know in the comments and we will add them to our list. For me the first thing that must be right is the bread. It has to have a crusty outer and soft inner. Thanks for the round up!